What would you say if someone told you that a simple gas can improve overall health? If we increase this gas in the body, then we will slow down the aging of our arteries, lower inflammation, improve our immune system and reduce oxidative stress. People who are deficient in this gas may suffer from hypertension, diabetes, atherosclerosis, Alzheimer’s, erectile dysfunction, peripheral artery disease, cancer, immune dysfunction and chronic inflammation. There are simple ways to measure this gas and improve production without the side effects of medication. This wonderful gas is Nitric Oxide. Our bodies make it, but unfortunately as we age, our ability to produce it declines- up to 85%! Nitric oxide is one of the most important signaling molecules in the body. It is required for the red blood cell delivery of oxygen from the lungs to the tissue. Nitric oxide helps keep the endothelial (the lining of the arteries) smooth and flexible. When the endothelial gets ridged, it causes atherosclerosis. In 1998 the president of the American Heart association, Dr. Valentin Fuster, stated that “The discovery of NO and its function is one of the most important in the history of cardiovascular medicine.” The cascade of health problems is associated with the decline of nitric oxide production. How can we boost NO production? Diet: Nitric oxide is produced from nitrogen, L-arginine and L-citrulline in our food supply. It is especially in foods such as red beets, spinach, kale, shrimp, watermelon, pomegranate and pistachios. Other nutrients needed are present in dark cocoa, walnuts, cranberries, oranges, garlic, black tea, salmon and cayenne pepper. But despite a good diet, we still may not have the ability to convert or produce enough NO. Avoid highly processed foods. Keep the diet clean to avoid an increase of free radicals and oxidative stress.Avoid nitrites, nitrates and nitrosamines in processed meats as this has been linked with increased cancer risk. Avoid mouthwash! Any mouthwash that kills bacteria in the mouth, also kills healthy bacteria. Oral bacteria is a key component to boost nitric oxide in the body. Exercise– Even just walking increases nitric oxide. 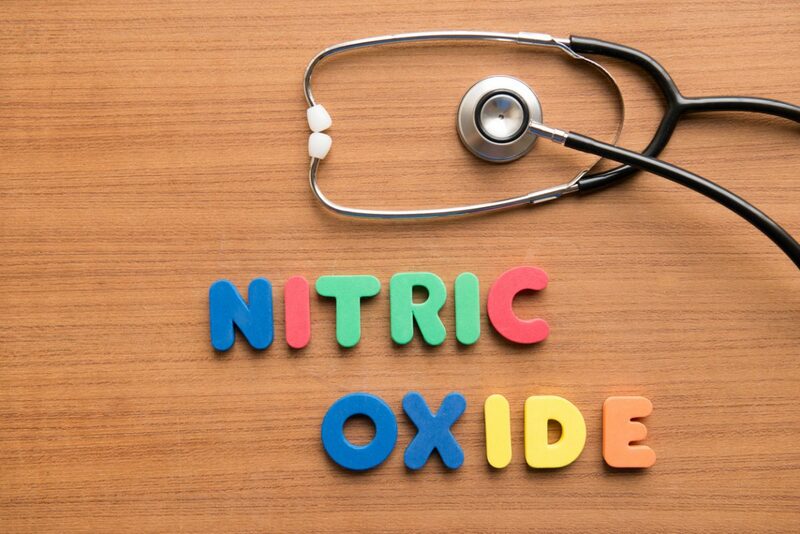 Activities that get your heart rate up and improve circulation will improve nitric oxide. Supplementation: Beet-root extract, L-Citrulline, Vitamin C, B12, Hawthorn Berry Extract, Vinpocetine, Ginkgo, Omega 3 fatty acids, Butcher’s Broom. Be careful taking L-Arginine for nitric oxide, as many people may not be able to convert L-Arginine to Nitric oxide, because of an inefficient enzyme, so it becomes less stable and can actually cause more oxidative stress. Following a diverse food plan rich in colorful foods and maintaining a regular exercise pattern can go a long way in the production and maintenance of healthy NO levels. Supplementation can help where the diet lacks or if there are other issues present! If you are wondering if your body is making enough Nitric Oxide, we now have an easy in-office saliva test. We offer great supplementation to help boost your NO and your life! 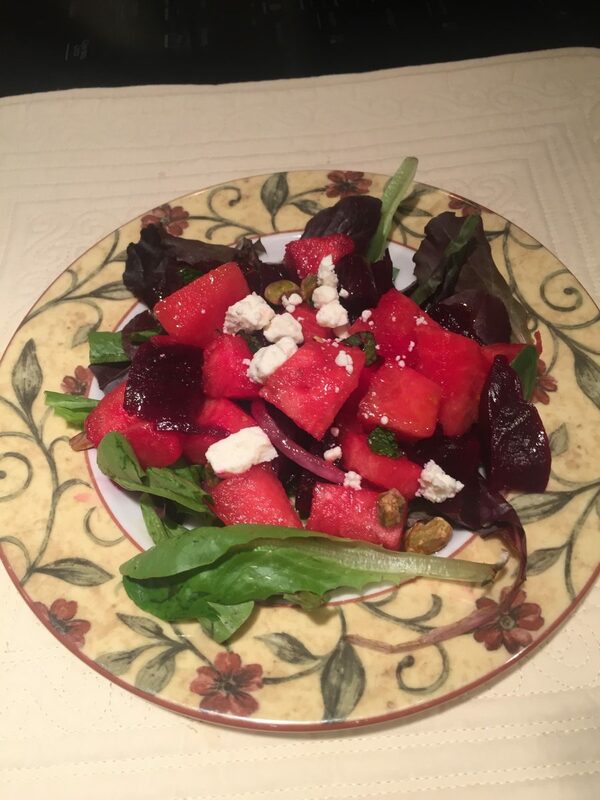 Boost your Nitric Oxide with this refreshing salad! Mix dressing in a jar and shake well before spooning onto salads. Divide spinach on 4 plates. Build the salads on each plate- ½ cup watermelon, ½ cup beets, top with thinly sliced red onion- about 5-6 thin pieces. Top with Julienne mint leaves, 1 tbsp pistachios and 1 tbsp crumbled goat cheese. Drizzle with 1 tablespoon of dressing on each salad (or to taste).